When you stay at Moholms Herrgård, you can combine a historical journey of discovery with exceptional sightseeing, intimate accommodations and wonderful dinners. 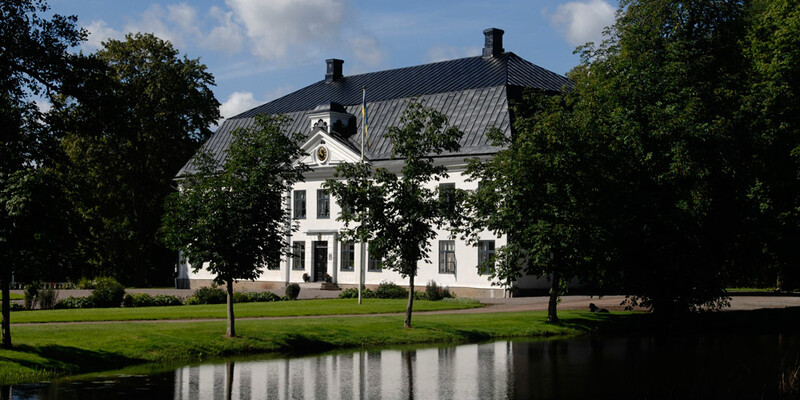 With our excellent geographical location Moholms Herrgård is the perfect point of departure for discovering Skaraborg in northern Västergötland. Our country estate is situated on an island in the Tidan river in the little community of Moholm about 20 km north of Skövde. When travelling by car, the distance from Göteborg is about 200 km, and from Stockholm, about 300 km. Lena and Micael Hamilton have owned and operated the estate since 2000. All meals are prepared by Lena, and a large portion of the produce comes from their very own organic kitchen garden where they grow root vegetables, different varieties lettuce as well as herbs. What we don’t grow ourselves we buy from other local, organic producers. Our dinners include appetizers, main course and dessert, and you eat both breakfast and dinner in our beautiful dining room. The hotel which is located in a wing of the main building has eight double rooms with showers and bathrooms. Lena is a very skilled interior designer and has decorated all of the rooms in different styles. The main building was constructed in 1761, and is currently occupied by the Hamilton family. Micael will be both your guide and all-around-man when you arrive, and will also help you get comfortably settled. Since we do not have more than 16 guests staying with us at any one time, we can guarantee you a unique experience with personal service and finely prepared dinners in a wonderful country estate atmosphere.